A wireless router is actually two devices, an access point and a router. •	Access point – allows wireless devices to connect to the network. When you use a wireless router, your network is called a "wireless infrastructure network". The wireless router is the main component for a home network. You can think of the wireless router as you would a cordless phone base station. Other wireless devices on the network, such as computers and printers, are like the cordless handsets. All communication on the wireless network runs through the wireless router, allowing the connected devices to talk to each other as well as the outside world. Many wireless routers have a built-in firewall to keep out unwanted access to your network. Many wireless routers also allow devices to connect to the network using a wired Ethernet cable. So a home network with a wireless router may have both wired and wireless devices connected to the home network. All devices that connect to your wireless router, whether wirelessly or through an Ethernet cable, have access to the same network, and can communicate with each other regardless of how they connect to the network. For example, a desktop computer connected by Ethernet can easily print to a wireless printer as long as they are connected to the same wireless router. Wireless routers pass information between devices connected to them as well as to the Internet by putting the information in small "packets". Each time a packet is transferred, the sending and receiving devices (a computer and the router, for example) verify that the packet was sent and received correctly before sending another. These packets can be sent through a wireless or wired connection, or both (for example, from a wireless laptop to a printer connected to the router with an Ethernet cable). 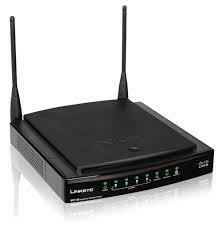 One of the primary functions of a wireless router is to facilitate transfer of these packets within its network. It does this by assigning a unique "IP address" to each device on the network. You can think of an IP address as you would your home address. Your house would be a device on the network and the router would the post office (and postal workers). But unlike your house address, IP addresses can be temporary. As devices come and go from the network they may be assigned a different IP address. The function in a router that performs this task is called a DHCP (Dynamic Host Configuration Protocol) server. Another primary function of a wireless router is to share one Internet connection with many devices on the network. Your ISP issues your "home" an IP address (from their DHCP server). That IP address is then turned into a set of local IP addresses for your network by your router. The local IP addresses look very similar. They are sets of 4 numbers and look like: 192.168.1.X or 10.0.1.X. The last set of numbers in the series (X) is what DHCP changes for each device on the network. The router usually takes the number ".1" for itself, such as 192.168.0.1. This is referred to as the gateway address. It then issues other devices similar numbers such as 192.168.0.9. Each router's DHCP service has a limited number of IP addresses it can issue. In some routers, such as Netgear routers, this last number can be between 2 and 254. In other routers, such as Linksys, the range is limited to between 100 and 149. You can imagine that if your home address changed all the time, the post office might have trouble keeping track and delivering your mail. The same thing can happen in a network. So it can be beneficial to assign a permanent, non-changing (called "static" or "manual") IP address to a device, such as a printer, which needs to communicate frequently with other networked devices. Having a permanent IP address can make the printer easier for computers to find on the network. Some printers allow you to do this using the advanced network settings from the printer's control panel. The best way to do this is to assign the wireless printer an IP address that is outside the range that the DHCP server issues. For example, if your Linksys router's DHCP service has a range limited from 192.168.1.100 to 192.168.1.149, a good IP address for your printer would be 192.168.1.200. Consult your router documentation regarding its DHCP range and the total IP address range that is supported. 1. Connect your printer to your wireless network. 2. Print a Network Configuration Page from the printer's control panel, and note your printer's IP address. 3. Type the printer's IP address into an Internet browser to access the printer's internal web page. 4. Select the Networking tab, then Wireless on the left side, then the IPv4 tab. 5. Click the Manual IP radio button. 6. Give the printer an IP address outside the DHCP range but no higher than 254 (for the last number in the address). What are all of these wireless standards? •	802.11b – established in 1999, this standard is all but obsolete today. It is slow and its only security is WEP, which is easy to break and makes your network insecure. If you must use WEP, the 'Open' mode is more secure than the 'Shared' mode. Although this standard is supported in most modern routers, the only reason to use it is if you have an older device that only operates on 802.11b. 802.11b operates in the 2.4GHz band, making it susceptible to interference from microwave ovens, Bluetooth devices, baby monitors and cordless telephones. •	802.11g – established in 2003, this standard is in wide use today. It is much faster than 802.11b and supports the most modern security standards (WPA and WPA2). In fact, 802.11g is faster than most cable, DSL and FIOS Internet connection networks to which they attach. Like 802.11b, 802.11g devices suffer interference from other products operating in the 2.4 GHz band. •	802.11n – established in late 2009, the most modern wireless networking standard is the fastest and least prone to interference. Like 802.11g, it supports the most modern security standards (WPA and WPA2). 802.11n can operate in either the 2.4GHz band or the less interference-prone 5.0GHz band. A device operating at 802.11n 2.4GHz, cannot connect to another device operating at 802.11n 5.0GHz.